We use only full size, regulation Las Vegas style equipment. Our charming and friendly staff are professionally trained in proper casino etiquette and procedure. Our tuxedo suited "Casino Manager" really helps bring the true Las Vegas atmosphere to your party. Blackjack, Craps, Roulette, Poker, Caribbean Stud, Baccarat are all available for your guest’s fun and enjoyment. From the excitement of turning over that Ace to hitting Lucky Seven, let RGV Las Vegas Nights bring that Las Vegas excitement to your next event. 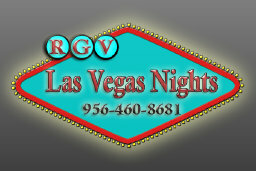 "We Bring Las Vegas to You"